Today, I am going to show you one very simple postural exercise to improve your standing alignment. The first picture has an excessively anterior-tilted pelvis and a pushed forward ribcage. 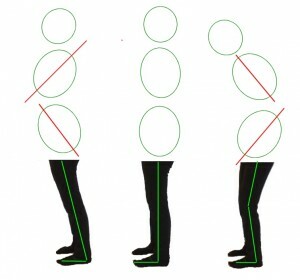 The side line between a pelvis and an ankle is tilted forward. Please notice a less-than-90-degree angle at the ankle joint. This angle would be even sharper with a positive heel shoes. This angle means that an ankle joint is now over-loaded. Your center of gravity is now shifted forward and the front of the foot carries the weight of the upper body instead of your hips and pelvis. A positive heel is a heel that is even slightly higher than a ball of your foot. 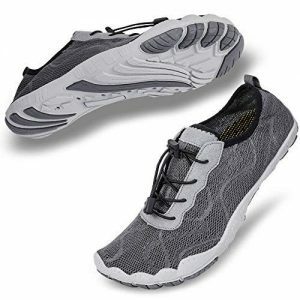 Hint: almost all commercial footwear has a positive heel, including your sneakers. A second picture demonstrates a perfectly aligned relationship between a pelvis and a ribcage. A pelvis and a ribcage are in neutral position. A hip joint is vertically aligned with an ankle. 90-degree angle between a leg and a foot. An aligned pelvis supports a weight of the upper body. This weight stimulates the bone production in your hips just the right way. Great osteoporosis prevention. A third picture presents a common “senior citizen” alignment with posterior pelvis, collapsed ribcage, and a C-curved spine. Not only it has a less-than-90-degree angle at the ankle joint, but also perpetually flexed knees. Every single joint is now incorrectly loaded and negatively affected. Arthritis anyone? 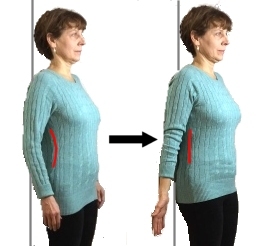 The goal of the simple postural exercise below is to put your pelvis and a ribcage into a more aligned position. It will wake up your kinesthetic awareness so you will be able to keep your ribcage and pelvis aligned without an extra effort. Stand sideways in front of the full-size mirror. Keep your feet parallel, hip-width apart. Then open your eyes and check your alignment in a mirror. Does it look similar to this (check the yellow lines)? 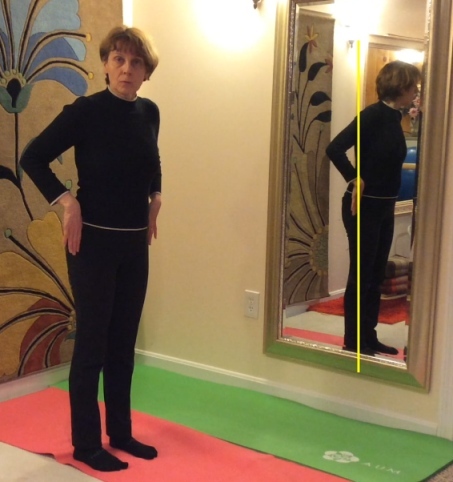 The postural exercise you are going to learn is somewhat similar to yoga’s Cats and Dogs, but in a standing position. The picture below is a video link. If you don’t want to watch a video, a description is under the picture. 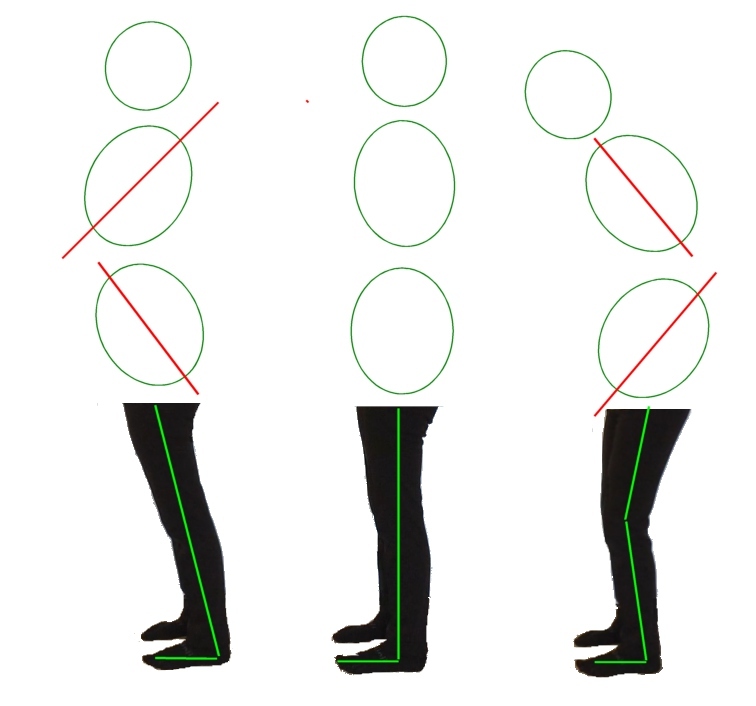 Start by standing with your feet parallel and hip-width apart. Slightly bend your knees and extend your arms straight in front of you. Bring palms together. On inhale, slowly open the arms to the side while arching your low back and bringing the shoulder blades together. Head goes up in line with your spine. On exhale, slowly round your back, stretch it, and bring your palms together. Continue this wave-like motion slowly and deliberately. Inhale when you open your chest and exhale when you round your back. Repeat 5-10 times. After you finish, straighten your knees, close your eyes and relax. Open your eyes and check your alignment in a mirror again. Does it look different? Does it feel that your weight shifted more to the heels? If yes, you just achieved a better relationship between your pelvis and a ribcage. If not, you may need more than one exercise to achieve a better standing position. In any case, keep doing this postural exercise several times during the day. The more you do it, the easier it will become. Stay tuned – next week I will talk about your shoulders and neck positioning.